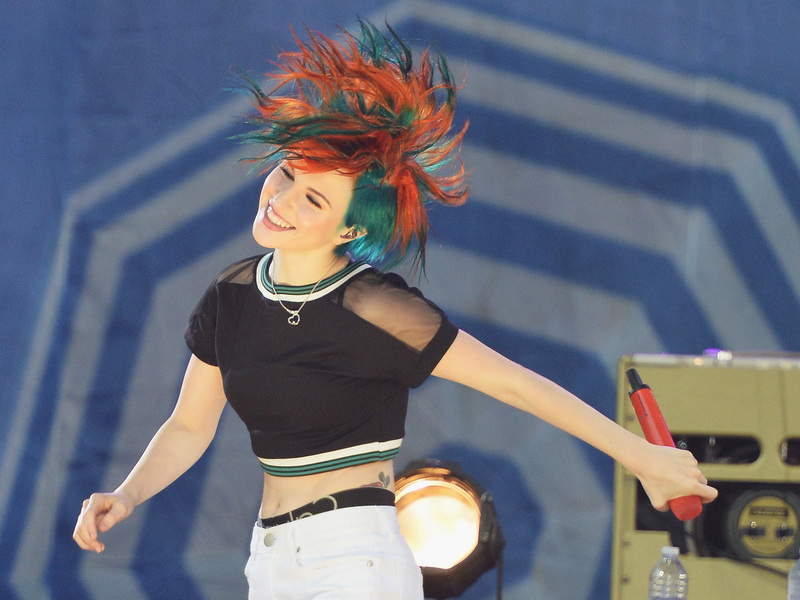 As the leading lady of Paramore, it is important that Hayley Williams maintains a certain image. Since her merge onto the music scene back in 2005, this singer and song writer has stood by her pop punk image, by sporting a series of hair colors in flashy shades. Her neon sparks of orange, yellow, and fuchsia have not necessarily shocked an audience, but more or less encouraged fans to follow the singer's lead. You have to give the girl credit for continuing to keep her style fresh. Her main color of choice appears to be a bright orange, but this gal has found countless ways to incorporate streaks, chunks, and ombre that most colorist would fight to get their hands-on. Most recently, Williams hit the stage with Paramore on Good Morning America , only to debut a new look that had her fans squealing with excitement. After all, a girl has to keep up somehow with all the other celebrities dying they hair funky shades of purple, blue, and pink. While everyone is riding the hair coloring trend, the timing has never been better to take a look back on the evolution of this punk rocker's hair. When you are not sure which color direction to take — go for both! Pink for when your feeling happy, orange for when your raging. When she first arrived on the scene, Williams stayed loyal to one color for as long as she could. Believe it or not, there was a time this artist lived happily as a blonde. I suppose when you have done it all, you are left with no other option but to show them off all at once. Am I the only one who thinks this looks like candy? Possibly her most sophisticated look, there was a time that Williams stuck to a, (for lack of a better term) average hair color. Sticking to her roots, this artist can't seem to shake her ties to orange, but tossed in some blue for good measure. Time will only tell what she decides to surprise us with next.